Students are driving change. 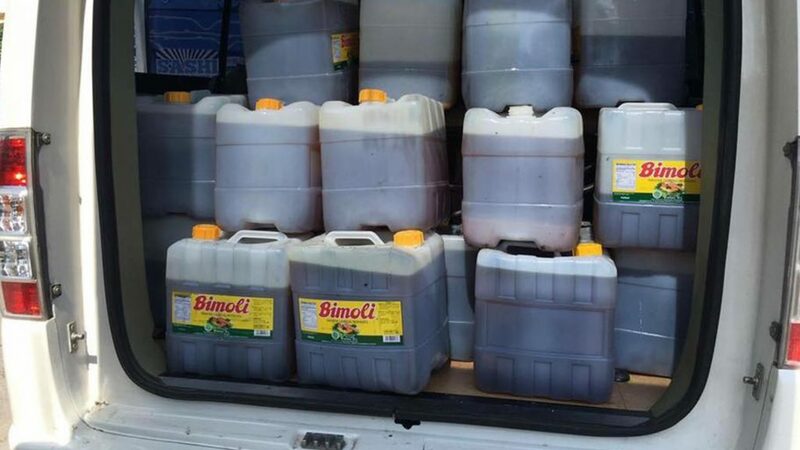 The Bio Bus social enterprise is a sustainable school transport services that delivers health and waste solutions for used cooking oil. 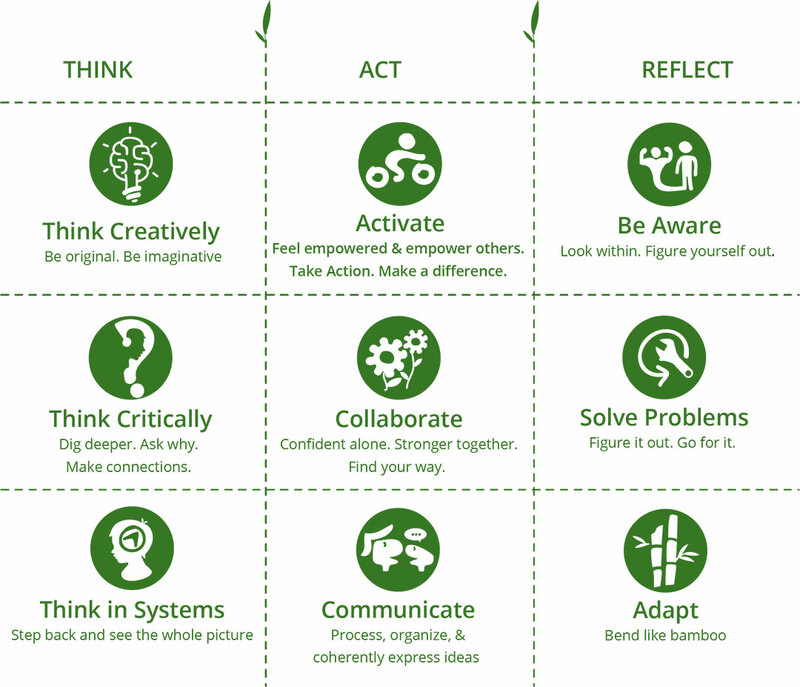 Student initiated, solutions focused, impactful and inspiring, this is learning for sustainability at its best. A market leader in green transportation, Bio Bus offers the only service in Indonesia operating on 100% renewable energy and the first B(100) Pump Station for public access in Indonesia. 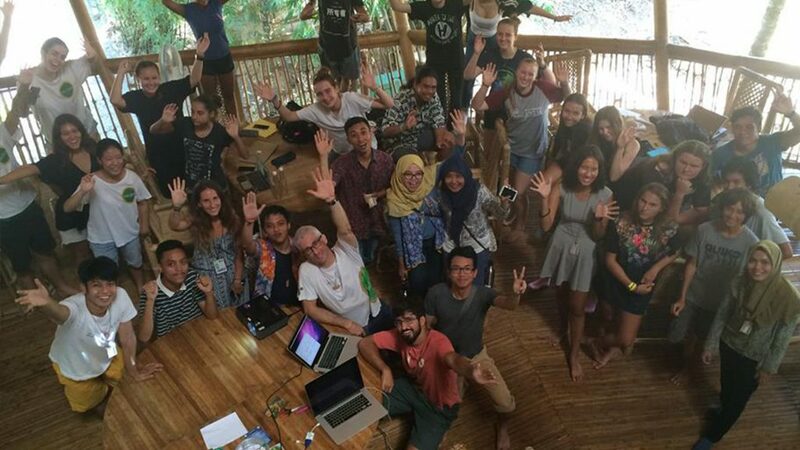 Bio Bus tackles social and environmental issues in Indonesia by starting local. Through collaboration with local communities, the students of Green School have established a powerful example of grass-roots action and entrepreneurial spirit. Economic growth and booming tourism in Bali, Indonesia have caused infrastructure stress, traffic problems and an increase in carbon emissions that contribute to climate change. Used Cooking Oil is unregulated, often used well beyond expiry and pumped with chemicals before reselling to eateries. This food contains carcinogens and has been linked to cancer and pulmonary disease. Dumping UCO in rivers causes acidification affecting Bali’s watersheds and ecosystems. There is a lack of awareness and meaningful education around these pressing issues worldwide. In partnership with local non-profit, Lengis Hijau (LH), the idea was launched for a bio-fueled “magic bus” powered by Used Cooking Oil. 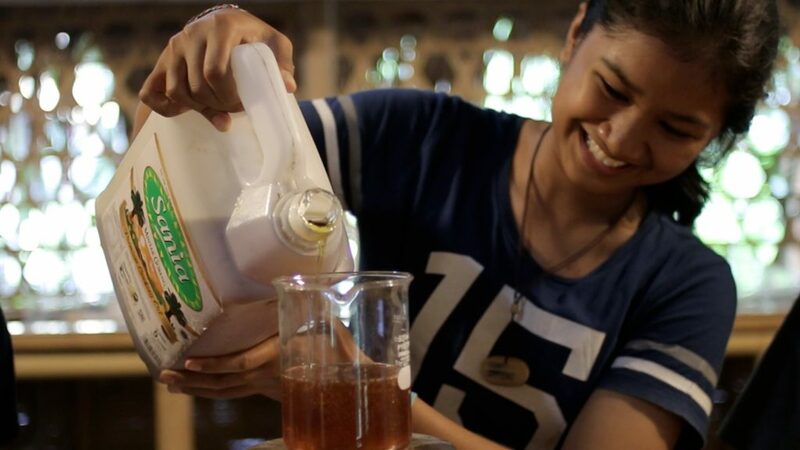 The glycerine by-product from producing biodiesel is made into bio soap and candles, which are sold at local farmers markets and sustainable events at Green School and in Bali. Bio Bus offers real-world, solution-based learning with a measureable outcome, offering the opportunity for international and local students to work with local organizations in a reciprocal and empowered manner. Bio Bus collaborates with local initiatives and villages to improve UCO practices and channel learning toward sustainability. We bring field trip opportunities to local schools in exchange for UCO via Kul Kul Connection, Green School’s community outreach program. 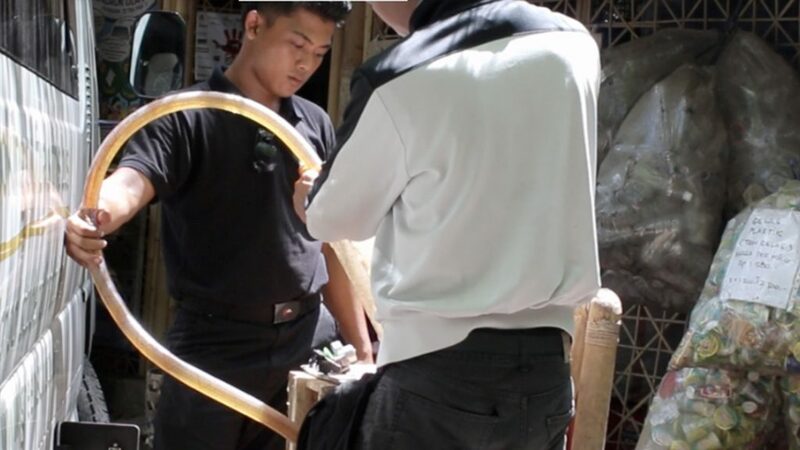 Every week, our ‘Grease Police’ patrol the streets in Bali, collecting used cooking oil from Hotels, Warungs and Restaurants, offering local businesses a responsible solution to dispose of their UCO. 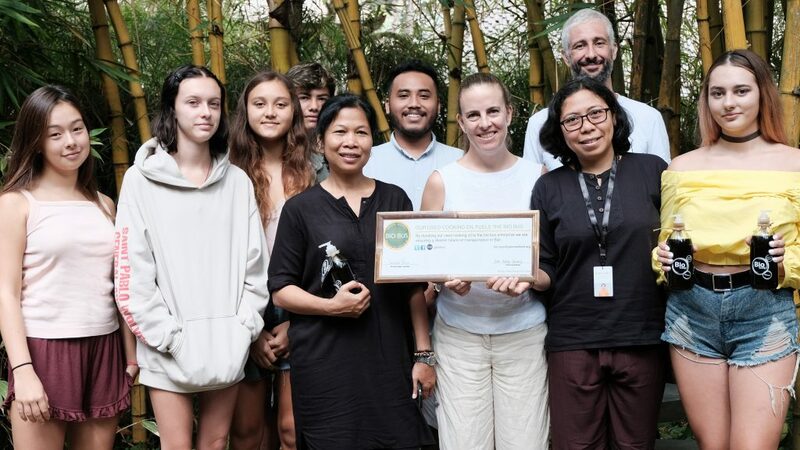 Bio Bus continues to set up replica projects at other Educational Establishments, including the French School, Anglo Chinese School and Canggu Community School in Bali, the Hong Kong Polytechnic University and the American School Lima, Peru. Indonesia faces some of the world’s biggest environmental problems. Bio Bus is a powerful example of the impact that student-centered, community-minded, entrepreneurial problem solving can make, to make our world sustainable. 1800 biodiesel rides provided a year, reducing up to 40 vehicles a day, saving up to 3 tonnes of CO2 emissions a year. Up to 1,500 litres of UCO collected each month. Over 300 international students enrolled in the Bio Bus educational program to date, with over 300 local students participating from Green School’s community outreach program. Involved in over 20 global conferences, raising awareness in Bali, Indonesia and globally around the hazards of UCO. Piloting replica projects at 4 new schools in Indonesia and 2 internationally. The students of Green School and young people across the world are motivated and are taking action. They are change makers in action. Supporting the award winning Bio Bus initiative is an opportunity to play a part in making our world sustainable through youth empowerment and the scaling up of this solution to create even greater positive impacts. Students at Green School are on a mission to add to the fleet of buses and to support other schools and communities to take action on transport. The fundraising target of $45,000 will enable an additional bus to be added to the fleet, for seat belts to be fitted to all buses and to provide practical tools and support to other schools and communities to implement their own Bio Bus initiative. Join the change makers, by giving an individual or corporate donation. Companies seeking to take a positive step towards becoming clean energy advocates are invited to partner with us. In exchange for your support, we would showcase your brand as at the forefront of renewable energy and promote your support of Bio Bus to our global network. 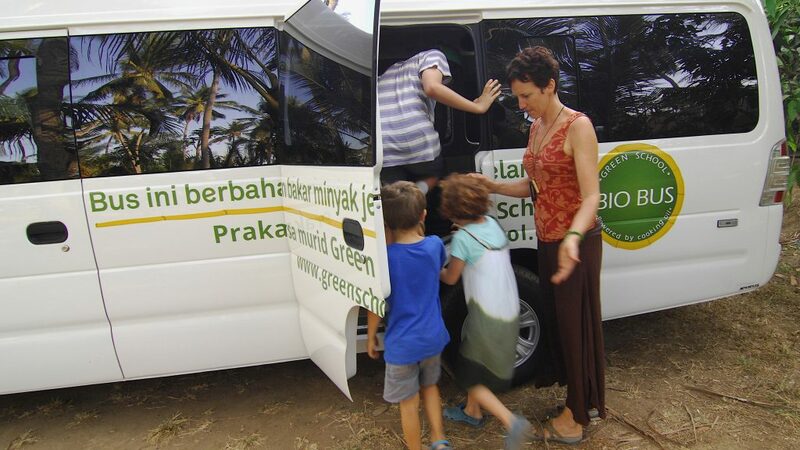 Green School Bali is a not-for-profit entity and 100% of your donation will go towards the Bio Bus social enterprise. For further information, please contact development@greenschool.org or support us by donating directly below.